In the year 2167, the Earth was devastated by the shockwave from the explosion of a nearby star, Hydrus Beta. With most of civilization destroyed, the survivors struggled to rebuild what remained. Over the next 189 years, mankind united to prepare for what is known as the "Second Wave" - a time when the remnants of the star are projected to impact Earth and wipe out all forms of life. In order to fight this, space academies were built throughout the Solar System to prepare a barrier system as a final defense. Katase Shima has always dreamed of being in space, and her dream has now been realized after being accepted to one of the space academies, Stellvia. This story chronicles the ups and downs of everyday life in space for Shima and her friends, but with the ever-present threat of disaster looming ahead. Names can certainly be deceiving. Upon hearing about this title, I thought it would involve chibi-space aliens or maybe something along the lines of UFO Princess Valkyrie. Honestly, it doesn't. There are quite a few titles out there that show everyday life in school (Azumanga Daioh, for example), but it's certainly not often that you see what it's like to go to school in SPACE. And what fun it is. Shima is your typical high school geek - shy, soft-spoken and a whiz at programming. In Stellvia she meets a host of friends who all have their different quirks, but fit together just nicely. Her best friend and roommate, Arisa Glennorth is roughly the equivalent of AzuDai's Takino Tomo - loud, energetic, but hardly as obnoxious. As the two of them tackle the challenges of student life - friendships, senior students, and the Second Wave, they show that there is indeed "life" in outer space - fun, tears and endless flying classes. Like most new titles these days, Stellvia makes use of CG to render most of the machinery - the students' spacecraft, the space academies (called Foundations) and other mecha are all wonderfully designed and look quite sleek. Animation for these scenes is quite smooth, and it's fun to watch the students piloting their individual craft (senior students get better class equipment). The art, however, is much better. Character designs, environments, and overall quality are colorful, sharp and detailed. There is a real sense of contrast between the dull interiors of the students' dorms, the busy look of the recreational areas, and the beauty of space that has been scarred by the disaster 189 years ago. The plot is a detour from the traditional "Malevolent Evil Force With Mecha threatens Forces of Truth, Justice and Liberty Who Also Have Mecha". There isn't even an enemy to pin a tack on (well, at least not for the first half) - it's just the effort to prevent another natural disaster from happening. Though the plot does take a major turn in the middle, it's basically something different and refreshing. While there is always an urgency to prepare for the Second Wave, the story focuses on the interactions between the characters, and you can see how they begin to be shaped by the environment and people around them. Although none of us would have taken classes like "FM02D3 : Flying Procedures in Space 1", at times you can almost point a finger at the screen and go, "Hey, some like that happened to me too". The characters grow on you, and you'll enjoy growing up with them. Unlike Azumanga Daioh, things do get serious. There is an uneasy tension between the respective foundations as the future (post-Second Wave) is unknown. For 189 years, mankind has not known war. For some, this might just be the right time to assert their power over others. As the tension and the pressure mounts on the students, things change for better or for worse. Here's where Stellvia get dangerously close to falling into the Wading Pool Of Cliched Anime Plots. I can't go into detail without spoiling the plot, but some people might not like how the story progresses towards the end or how certain characters develop (I certainly didn't like some part of it). However, these things are not serious enough to change my view of this title (although I'm still waiting to see how the story ends). Voice acting is excellent (for the original Japanese dialogue), and you can tell that some of the the seiyuu really got into their characters' personalities. Each one is varied and yet still interesting. Some parts of the soundtrack reminded me of music from Final Fantasy VIII (which could be good or bad), and a lot of it sounds like game music. But it's GOOD game music, mind you. The opening and ending themes are neither cute nor stylish, but they're a good match for the anime. All in all, this is an excellent title. 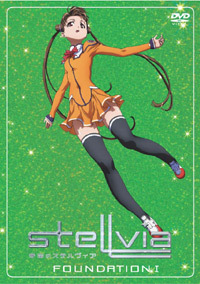 I know people who would cringe at the thought of watching "another" anime about high school kids and their little misadventures, but Stellvia isn't that generic and it *might* just appeal to those who don't have liking for this particular genre. As said in the awesome student welcoming ceremony, "Welcome to Stellvia!"